How to install and Connect to MySQL in NodeJS? Hope you have already installed nodeJS, If not Please install first. Question: How to instal new package in nodejs? Question: How to instal MySQL? Question: How to update MySQL? Question: How to include MySQL? Question: How to connect to MySQL in nodeJS? Question: How to connect to MySQL in single string in nodeJS? 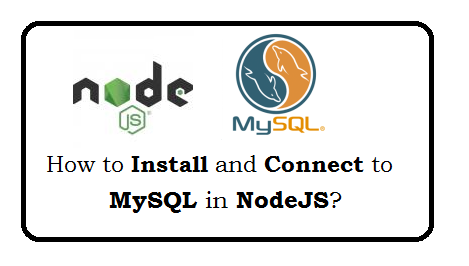 Question: How to get records from mysql database in node.js? Question: How to insert record in database? Question: How to print the query while inserting record? Question: Given another way to insert data in MySQL Database?